Historical romance inferring scandalous romantic links between Mary Magdalene and Judas Iscariot, heralds arrival of Volume II in William Hearth’s series of fearless historical scholarship. Did their lives represent defiance of rabbinical law? What if these well-known historical figures, tempted by fate to become lovers, were actually vegetarians; linked by dietary practice to the religious and cultural traditions proffered by Pythagoras, Buddhism and Ahimsa?Such knowledge would demand from us a more conscientious approach to life. 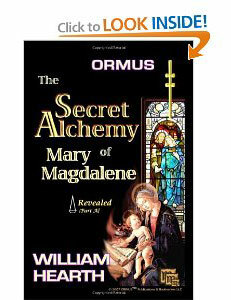 Read now, the insidiously artful “Secret Alchemy of Mary Magdalene Revealed “Part A” and be ready when “Part B” is released this Christmas. Much anticipated “Novel” arrives in spring 2011. Hearth speculates, “At a time when ancient vegetarian philosophies clashed with the Judaic-temple practice of slaughtering innocent animals for blood sacrifice…” one question in particular begs an answer: “What if these star-crossed lovers, were actually vegetarians? Their Way of Life and dietary practices would have caused them to be labeled as heretics and outcasts throughout Judean society as being Blasphemous… A crime punishable by death,” whereas these days, such knowledge might elicit a more conscious, enlightened Way of Life.